Willard Memorial Chapel Preserving our Nations History Preserving our Nations History. 2 Auburn Theological Seminary School 1820: Original seminary built. 1820: Original seminary built. 1821: First students arrived. 1821: First students arrived. Students included scholars, missionaries, and ministers. Students included scholars, missionaries, and ministers. The original seminary was demolished in 1892, which was the same year that the cornerstone of Willard Chapel was laid. 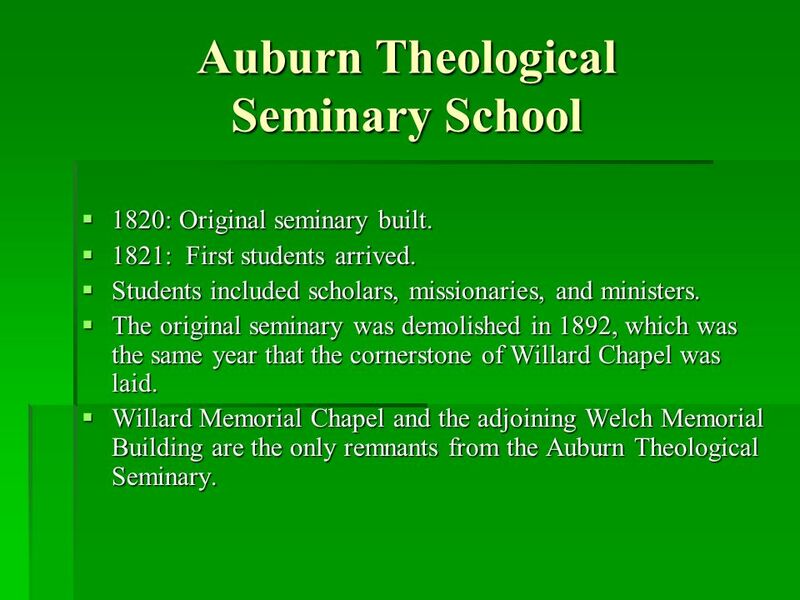 The original seminary was demolished in 1892, which was the same year that the cornerstone of Willard Chapel was laid. Willard Memorial Chapel and the adjoining Welch Memorial Building are the only remnants from the Auburn Theological Seminary. Willard Memorial Chapel and the adjoining Welch Memorial Building are the only remnants from the Auburn Theological Seminary. 3 Willard Memorial Chapel Willard Chapel was meant to be a memorial for Dr. Sylvester Willard and his wife, Jane Frances Case Willard, from their daughters Georgiana and Caroline. Willard Chapel was meant to be a memorial for Dr. Sylvester Willard and his wife, Jane Frances Case Willard, from their daughters Georgiana and Caroline. The interior of the chapel was designed and handcrafted entirely by the Tiffany Glass and Decorating Company of New York City. The interior of the chapel was designed and handcrafted entirely by the Tiffany Glass and Decorating Company of New York City. 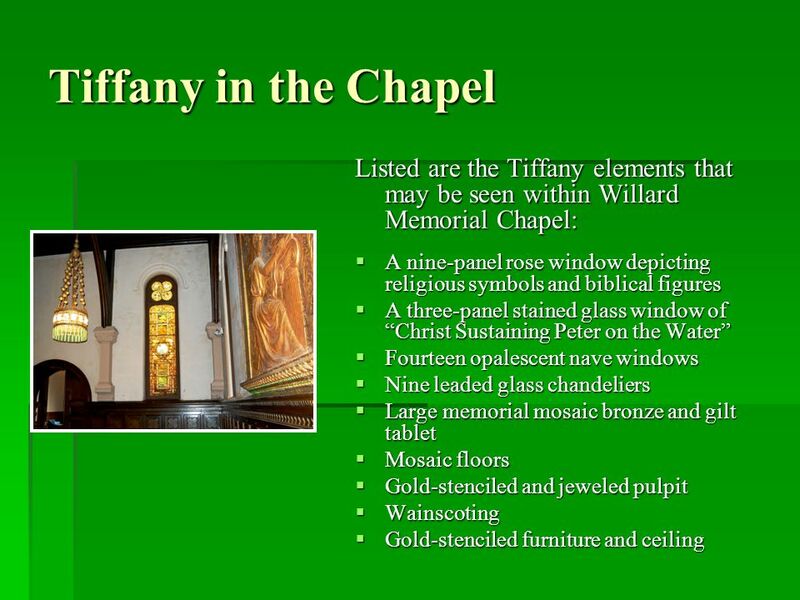 Willard Memorial Chapel is the only complete and unaltered totally Tiffany designed religious interior known to exist in the world. 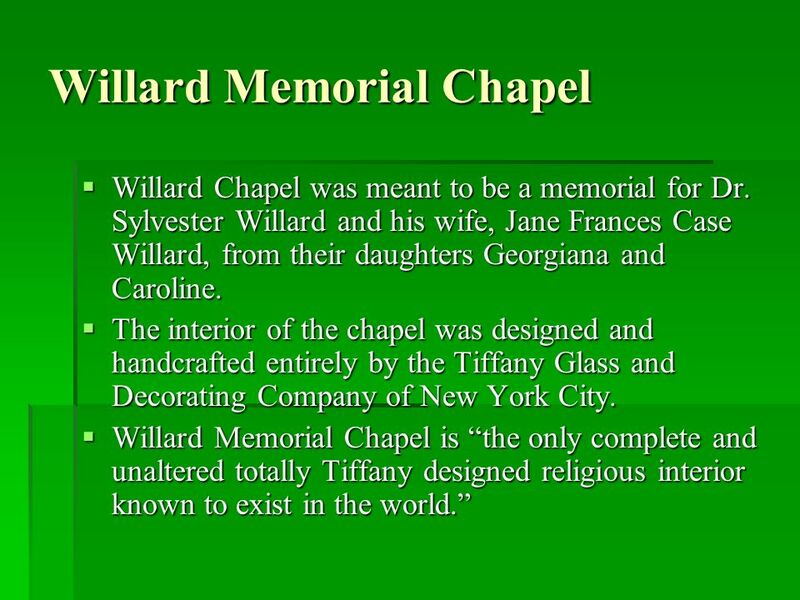 Willard Memorial Chapel is the only complete and unaltered totally Tiffany designed religious interior known to exist in the world. 4 Louis Comfort Tiffany 1848 - 1933 For more than 50 years, the name Tiffany was synonymous with master craftsmanship, as well as superior art. For more than 50 years, the name Tiffany was synonymous with master craftsmanship, as well as superior art. Louis C. Tiffany preferred experimentation with his mediums for the purpose of creating or improving artistic works. Louis C. Tiffany preferred experimentation with his mediums for the purpose of creating or improving artistic works. He would work with various artists, glassmakers, stonemasons, mosaicists, modelers, metalworkers, wood- carvers, potters, and textile workers. He would work with various artists, glassmakers, stonemasons, mosaicists, modelers, metalworkers, wood- carvers, potters, and textile workers. Tiffany used the elements of pattern, texture, color, and light together in order to produce his artistic expressions. 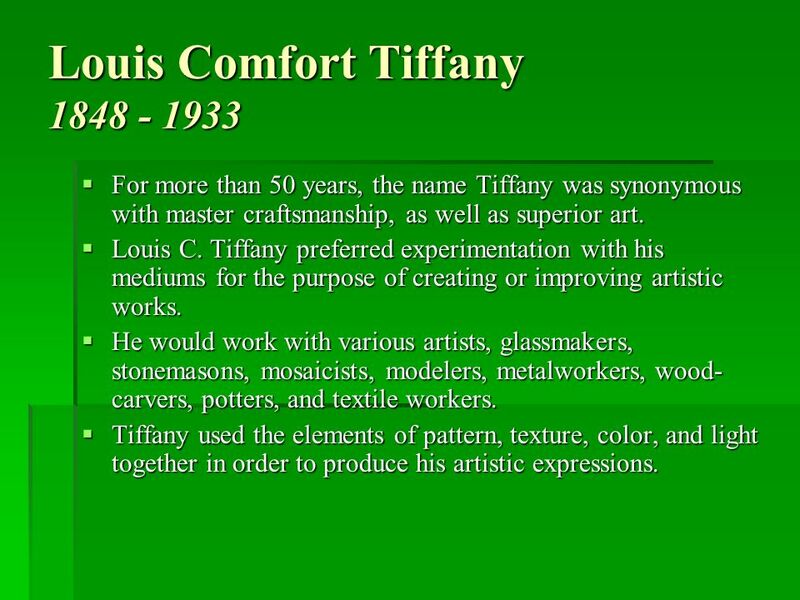 Tiffany used the elements of pattern, texture, color, and light together in order to produce his artistic expressions. 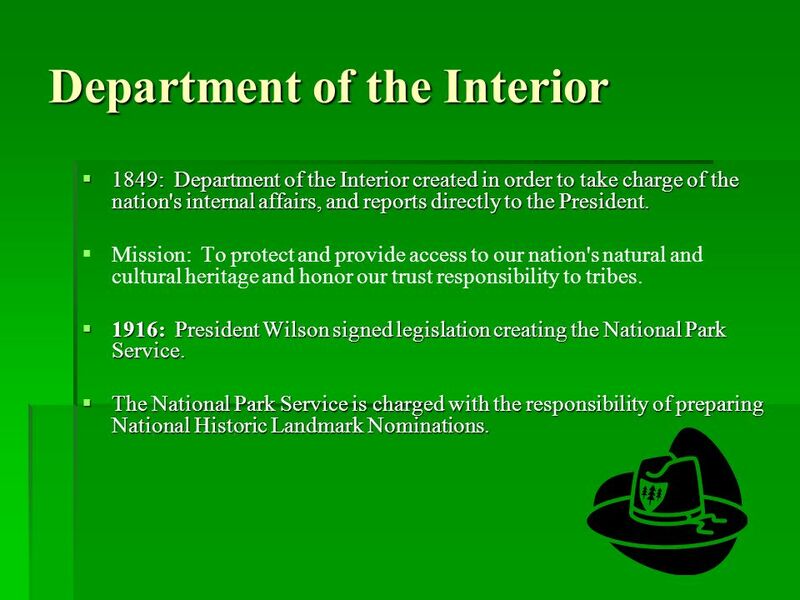 6 Department of the Interior 1849: Department of the Interior created in order to take charge of the nation's internal affairs, and reports directly to the President. 1849: Department of the Interior created in order to take charge of the nation's internal affairs, and reports directly to the President. Mission: To protect and provide access to our nation's natural and cultural heritage and honor our trust responsibility to tribes. 1916: President Wilson signed legislation creating the National Park Service. 1916: President Wilson signed legislation creating the National Park Service. The National Park Service is charged with the responsibility of preparing National Historic Landmark Nominations. The National Park Service is charged with the responsibility of preparing National Historic Landmark Nominations. 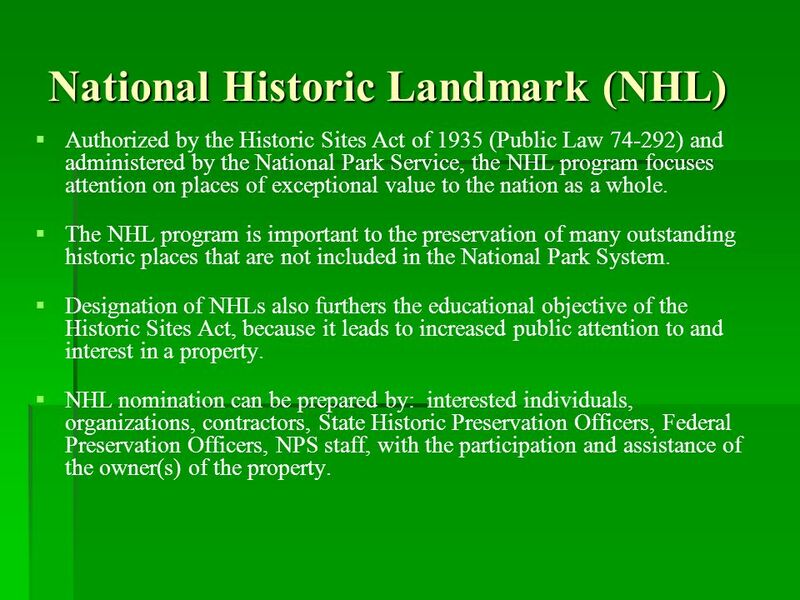 7 National Historic Landmark (NHL) Authorized by the Historic Sites Act of 1935 (Public Law 74-292) and administered by the National Park Service, the NHL program focuses attention on places of exceptional value to the nation as a whole. The NHL program is important to the preservation of many outstanding historic places that are not included in the National Park System. Designation of NHLs also furthers the educational objective of the Historic Sites Act, because it leads to increased public attention to and interest in a property. 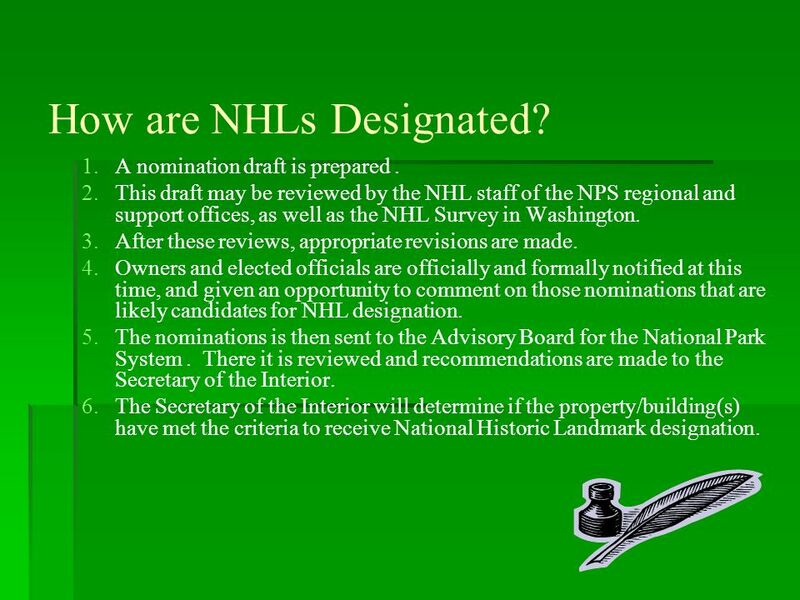 NHL nomination can be prepared by: interested individuals, organizations, contractors, State Historic Preservation Officers, Federal Preservation Officers, NPS staff, with the participation and assistance of the owner(s) of the property. 8 How are NHLs Designated? 1. 1.A nomination draft is prepared. 2. 2.This draft may be reviewed by the NHL staff of the NPS regional and support offices, as well as the NHL Survey in Washington. 3. 3.After these reviews, appropriate revisions are made. 4. 4.Owners and elected officials are officially and formally notified at this time, and given an opportunity to comment on those nominations that are likely candidates for NHL designation. 5. 5.The nominations is then sent to the Advisory Board for the National Park System. There it is reviewed and recommendations are made to the Secretary of the Interior. 6. 6.The Secretary of the Interior will determine if the property/building(s) have met the criteria to receive National Historic Landmark designation. 9 Activity Match the description on the left with the correct option on the right: ___1. Reports to the Department of Interiora. Department of Interior ___2. Part of the Presidential Cabinetb. National Park Service ___3. 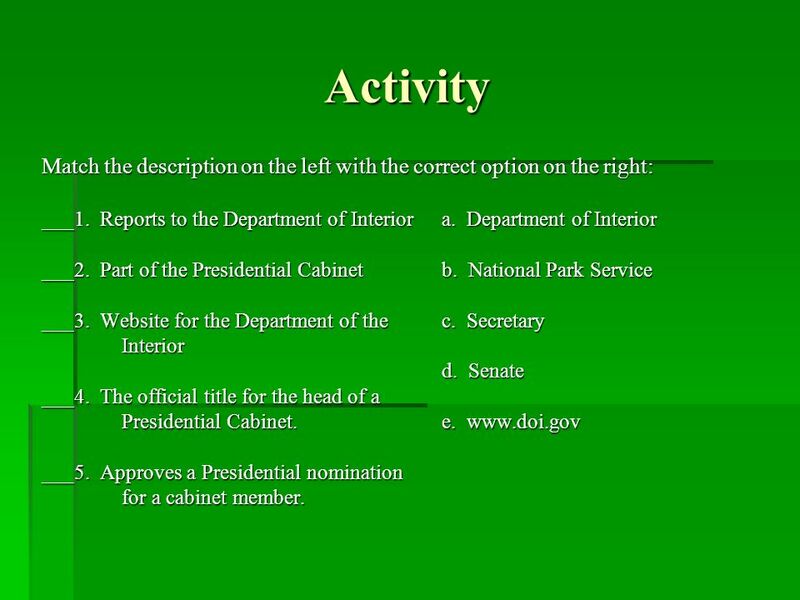 Website for the Department of the c. Secretary Interior d. Senate ___4. The official title for the head of a Presidential Cabinet.e. www.doi.gov ___5. Approves a Presidential nomination for a cabinet member. 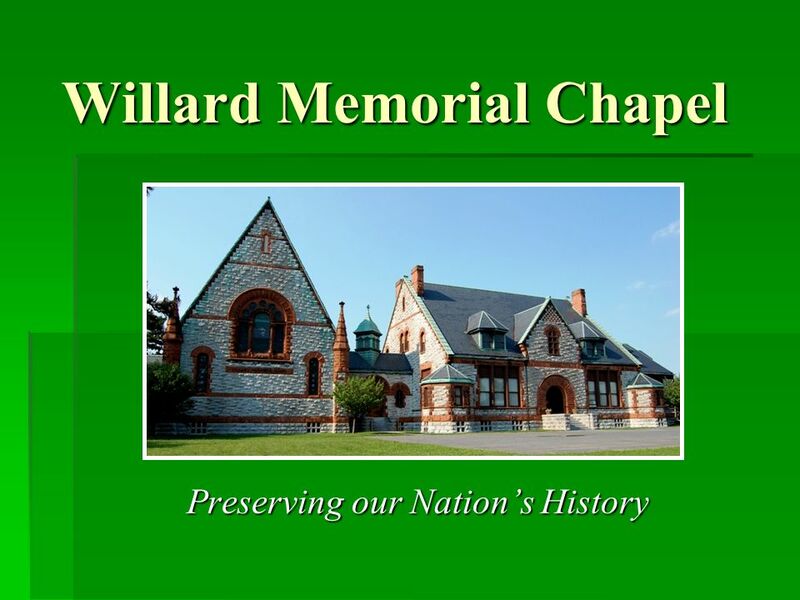 Download ppt "Willard Memorial Chapel Preserving our Nations History Preserving our Nations History." Historic Preservation Tax Credits The Process and Avoiding Common Problems National Park Service, Technical Preservation Services. Historic Preservation Tax Credits The Process and Avoiding Common Problems Charles E. Fisher New York City, June 2009 National Park Service, Technical. Historic Preservation and Affordable Housing National Historic Tax Credit Conference Chicago September 2008 Judith L. Kitchen, Ohio Historic Preservation. Qualifying Buildings National Register Properties – Individual or in District Generally 50 Years Old Architectural or Historic Significance Local Landmark. Museum Property Overview for Interagency Committee of Property Managers Ann Hitchcock, Chief Curator National Park Service January 26, 2006. U.S. Transition – Forming the Next Government 1. On November 4, 2008: The longest presidential campaign in U.S. history ended. A record 130 million Americans. Chapter 16 Accounting and Reporting for the Federal Government. Tuskegee University Photo Tours Historical Landmarks. 11 th CENTURY. Head of Christ 11 th century This is the only known example of stained glass from the 11 th century. It was originally in the Abbey church. HERITAGE - LOCAL GOVERNMENT by Susan O’Neill. Heritage - Local Government Strategic heritage planning – identifying and listing heritage items and translating. 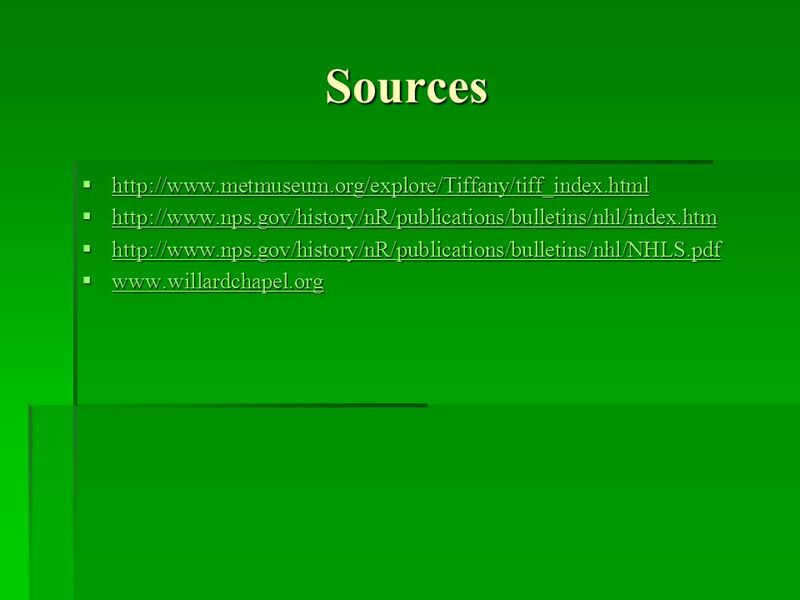 Ahoskie, North Carolina and its Historic Districts Update October 5, 2006. Serious Accident Investigation REPORTS. Lesson 12 Objectives Use a template to correctly fill out a 24-Hour Preliminary Report and list all the steps.